The Carnival Legend was built in 2002, and it has been refurbished. Everything on board seems to be in good condition. The decor is over the top busy and garish to our eyes, although the displays of Bohemian glass in the stairwells are nice. 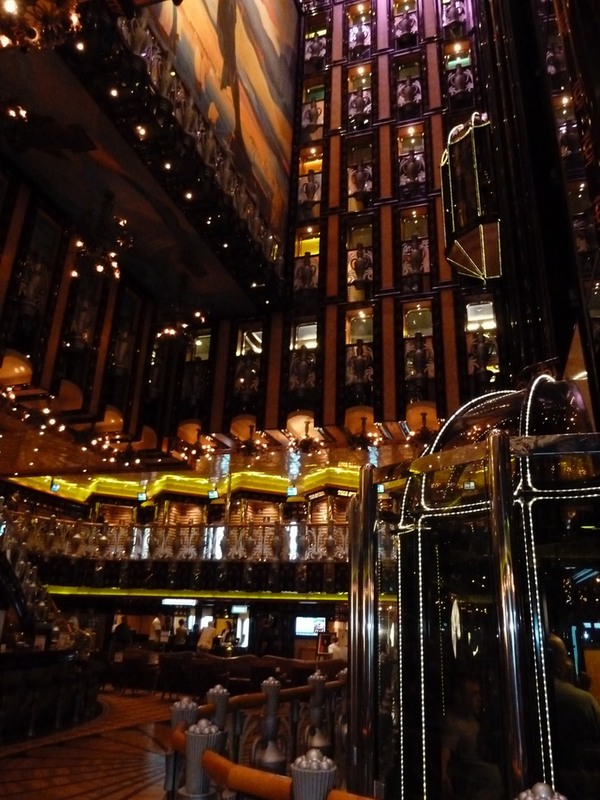 The ship tends to be very noisy because there are so many hard surfaces, like the tile floors and ceilings in the Lido Unicorn Restaurant (the casual buffet dining area). The crew on the Legend is multinational, and they are very friendly and do their jobs very well. They have helped to make our experience on the ship a pleasant one. The passengers are also pretty good people: even though there are many children on board, ranging in age from infants to teenagers, the children have been very well behaved. This is in notable contrast to Susan’s experience on the Norwegian Spirit. Possibly the best feature on this ship is the ventilation fan in the bathrooms that runs constantly. It has enough power to deflect a tornado, and as a result this ship is the only place we’ve ever been able to shower without fogging the mirrors. That is impressive. The bathroom door has a door check, so the door can’t swing wildly when the seas are rough. This ship has bars in every nook and cranny. Many of them have a stage for entertainers, but the entertainers are placed in areas where it is difficult to just sit and listen to them. The lounge entertainers are mostly solo, with one or two duets; there are no bands on board. This kind of entertainment did not call to us at all. The Lido Unicorn restaurant is a complex set-up, with the food split between several areas. While it does help to disperse the crowds a bit, finding what you are looking for isn’t always easy. The tables are set up more like a restaurant, which makes moving between them somewhat difficult. Our cabin is smaller than what we are used to on the ms Amsterdam. However, it is furnished in such a way that it feels spacious. We have been to three shows: 2 productions with the ship’s orchestra, singers and dancers, and a singer named Marcus Anthony, who is from St. Thomas and has worked with many Motown singers. The first production show and Marcus Anthony were very good. The ship’s orchestra is excellent! The second production was of very mixed quality, which was sad because the group has a great deal of talent. We skipped the comedian and the show featuring the passengers. We have also skipped the nightly comedy shows in the smaller theater. In the interests of making the Legend a ‘fun ship’, every night at dinner, the entire wait staff has had to either sing or dance for us. Maybe it is fun for some, but not for us. The disembarkation process is a little different from what we are accustomed to. For starters, we gave the company all the information about our flights during the online check-in process. The other thing that is clearly different is that we must be out of our cabins by 8:30 AM, no matter what time we will be disembarking. Disembarking turned out to be a rather amazing experience. Even though we were in the next to last group to be called for disembarkation, we were off the ship within an hour after the time we had to vacate our cabins. The process was very efficient, the best disembarkation experience we’ve had. There are other items worth commenting on. For starters, there are no serious grab bars in the bathroom, which makes the bathroom an unsafe place for older passengers. We are accustomed to having a theater where we can go to watch movies; there was none on the Legend. The daily program has a long list of activities, but the program is difficult to read, between the tiny print and the way it is arranged. The most prominent activity is bingo, which is available at all hours of the day. It is also noteworthy that the daily program provides no information about the ports beyond the emergency phone number and the time of the last tender and/or departure. Carnival’s emphasis is on fun. To that end they had a cruise director on board who always spoke with what sounded like artificial enthusiasm, too much hype and too much adrenaline. In addition he spoke very fast and had a British accent that made him difficult to understand. In his defense, though, we must say that when he did the disembarkation talk, which we watched on the cabin TV, he did speak at a reasonable rate, and he did a good job with that presentation. 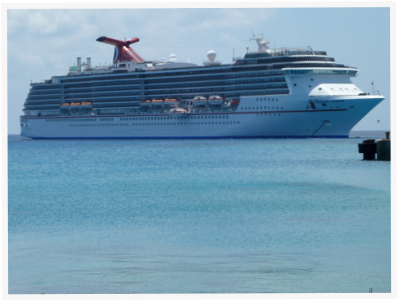 Would we go on a Carnival cruise again? Perhaps, if there is a good reason to do so. But we are far more comfortable on Holland America ships.